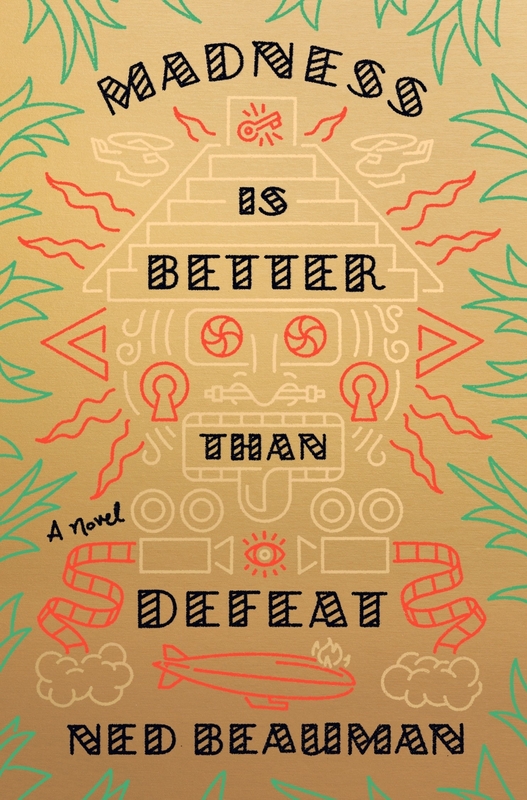 Channeling Thomas Pynchon and David Foster Wallace, Ned Beauman’s novels are sprawling and hilarious works that tumble into realms of inspired, lost-in-time exotica. 2012’s The Teleportation Accident (longlisted for the Man Booker Prize) opens in Weimar-era Berlin, follows an ambitious set designer whose boundary-pushing stagecraft led to the injury of his lead actor, and ends up in Hollywood, colliding tentacles-first with the H.P. Lovecraft subculture of mid-century American mythmaking. 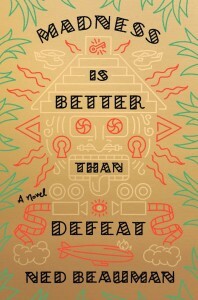 Beauman’s new novel, Madness Is Better Than Defeat, returns to mid-century Hollywood but ends up deep in the jungles of Honduras, amidst feuding camps, psychedelic fungi, and long-standing grudges. Like The Teleportation Accident, Madness Is Better Than Defeat is a demented, madcap caper that lands better with questions unasked and disbelief suspended. In New York, trust fund lothario Elias Coehorn Jr. is pulled from the ritzy bar scene by his father and given a mission. Coehorn Sr. is an international kingpin and his Eastern Aggregate Company has found an untouched temple in the jungles of Honduras. Similar to the incredible relocation of the Metropolitan Museum of Art’s Temple of Dendur from Egypt to New York, Coehorn Sr. wants the Honduran temple disassembled, transported and re-installed onto his estate. And he wants his son to lead the charge. Threatened with losing his claim to the family fortune, Elias accepts his father’s request and journeys south with a team of assistants. Also in his convoy is a chef, an anthropologist, and a slew of unnecessary luxuries like fine booze and a mobile icemaker. Meanwhile in Hollywood, first-time director Jervis Whelt is about to get his big break. The mysterious producer Arnold Spindler has asked him to shoot a film called Hearts in Darkness, a jungle caper in the same vein as the recent hit Congo Cavalcade. But while Congo Cavalcade was shot on a soundstage, Hearts in Darkness would be shot in a real jungle, and Spindler recently caught wind of a temple in Honduras that would be a perfect setting. Not to turn down the chance of a lifetime, Whelt assembles his crew and heads to the jungle. When he arrives, Coehorn’s gang has beat him to the temple and is already halfway through their disassembly. The Angelenos refuse to let the New Yorkers complete their task, and the New Yorkers insist that the temple belongs to them and no movie can be shot. The two parties reach a stalemate, and decide, ridiculously, to stay. They dig their heels into the Honduran soil and wait for the other camp to break. To borrow a line from the novel’s narrator, Zonulet, a reporter-turned-CIA-agent investigating what the hell happened down in Honduras, this is “where the story passes from the merely cockamamie into night-blooming dementia praecox.” The two camps stay for years. No one asks to leave; they sink into their new lives as jungle settlers, hunters and foragers. Jervis Whelt, having blown through all his film reels shooting test footage, discovers a way to synthesize fresh resources by doing something with ammonia, urine, and tapir blood. Factions emerge and new leaders rise to power as the years unravel onward. Similar to how the two camps commit entirely to their pre-ordained tasks, Beauman too seems to lock into this plot and let it carry him (and his readers) wherever it flows, for better or for worse. The story is cartoonish and ridiculous — borderline stupid, if its many charms don’t win out — but Beauman’s whip-smart dedication matches the blind trust with which his characters follow their leaders and meet their destinies. Beauman repeatedly writes himself into corners, but emerges unscathed by finding new angles with which to develop this history. The narration jumps spastically between Zonulet’s investigation to Zonulet’s personal backstory, to unsent letters from heartsick jungle-dwellers and testimonials from other journalists investigating the Honduras scoop. Despite its bagginess and thin premise, Madness Is Better Than Defeat finesses a kind of metafiction about believing in something and seeing it through to the end. Sticking with Beauman throughout his novel is not dissimilar to holding it out with Whelt and Coehorn and believing in their visions, and there’s a shimmering sort of self-referential beauty in discovering that parallel. It may not be a worthy venture, and may not be a good use of one’s time, but it’s a wild, memorable story and an experience from which we can learn something about ourselves. Perhaps those two camps, artistry and experience, can be found side-by-side, idling in some distant, metaphorical jungle.